One thing I love about having a blog is the ability to reach out and learn about others. I have a slew of blogs I follow (197 blog to be exact) and I enjoy reading through them to learn more about the bloggers who share the same interests in the kitchen as well as a glimpse of their corner of their world through food. With this week's Foodie Freebie Friday, I really enjoyed reading about the hometowns where folks came from. Everything from the birth places of well known foods and food related companies, unique and fun trivia and even how your hometown made an impact in history, were all shared through your comments. Thanks to all those that left a comment... it's a great thing to be able to use my blog to share my culinary adventures as well as learn about you in the process! Congratulations Megan! I hope you have a fabulous time with the vanillas and I look forward to checking out your blog (yet another one to add to my reader!). 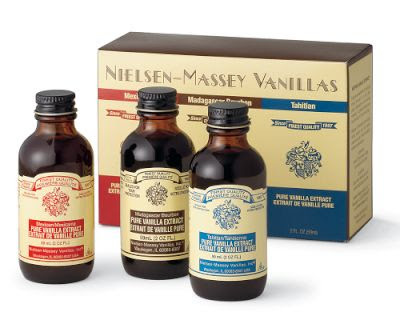 Please email me at [email protected] so I can confirm the mailing address in which to send your vanilla trio. Thanks again to all those that commented and stay tuned to the next Foodie Freebie announcement on Monday, January 26, 2009! Don't feel discouraged if you haven't won yet - I have a whole year's worth of freebies ahead and next week there will be 2 winners chosen for the Foodie Freebie Friday! I'm so impressed by the food community you have built around you. I'm excited to watch it continue to grow. Congrats on 100 posts!